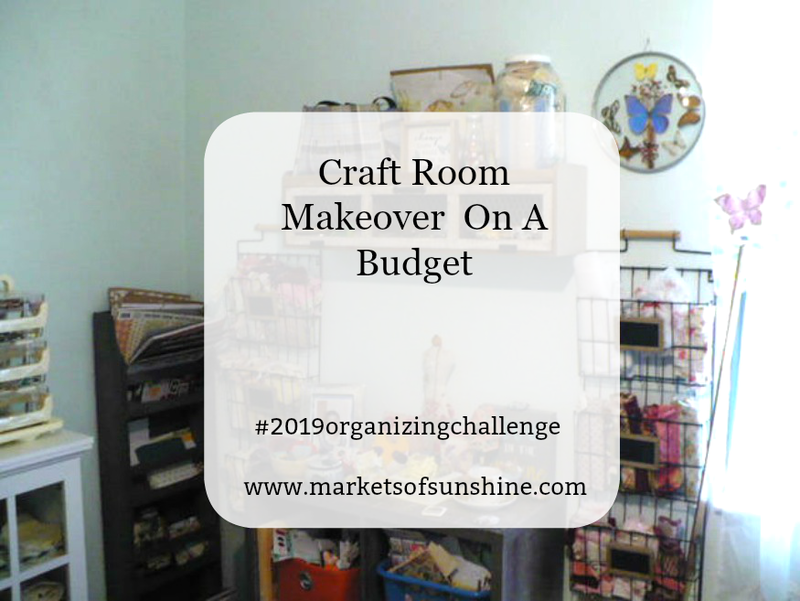 Welcome to my #2019organizingchallenge series. 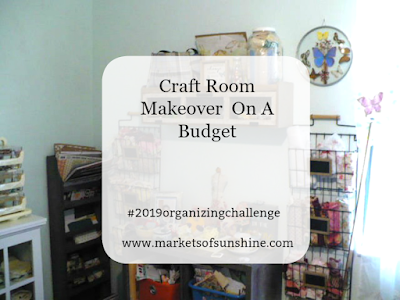 Each month I am organizing and redecorating every room in my house. 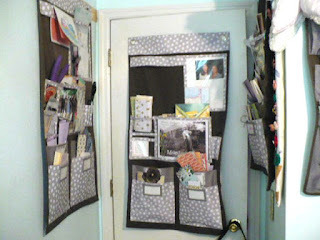 For March it was my craft room. Here are the after photos. Enjoy! The wall color was a green and orange. It was very faded looking. Now we have a beautiful soft sea green farmhouse color on the walls that makes all the new farmhouse decor really stand out. 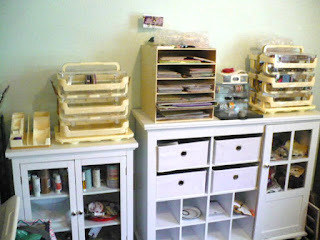 The furniture is white and has plenty of storage as you can see in the photo. This holds all my embellishments such as ribbon, washi tape, brads and more. 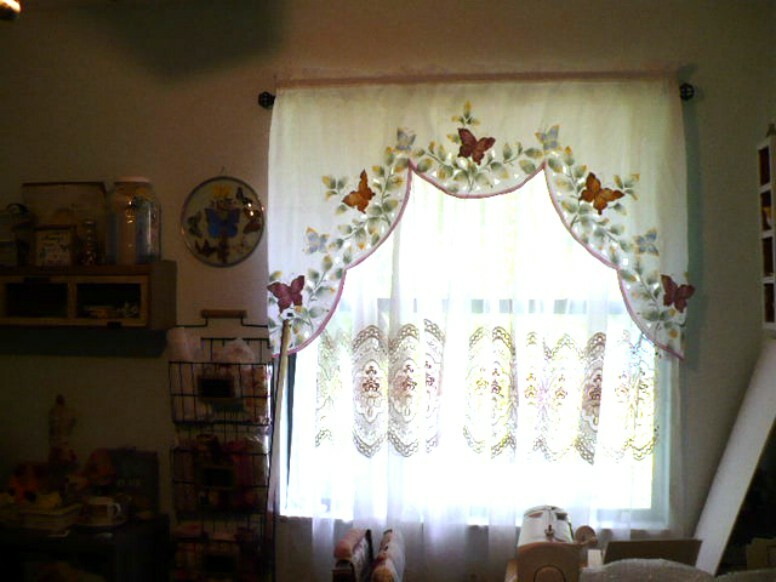 The window treatment is a vintage curtain and valance found on one of my garage sale ventures. These storage organizer bags are right behind the door so it didn't take up valuable wall space. 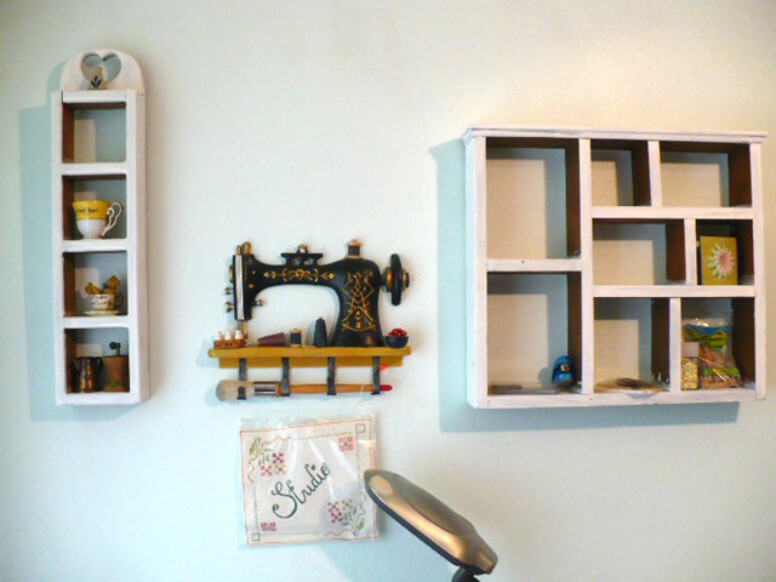 This adorable farmhouse shelf is right over my shipping area. It keeps all my tools in reach. Cute wood handmade shelves were added along with a vintage sewing machine for plenty of storage right over my sewing table. This is my sewing supply corner. 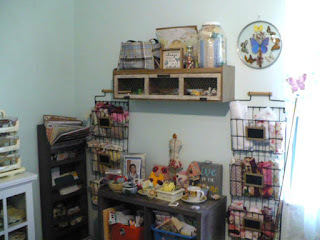 The wire racks hold my fabrics and have chalkboard labels on each shelf. The cube table in the middle has four spots for baskets and lots of storage possibilities. 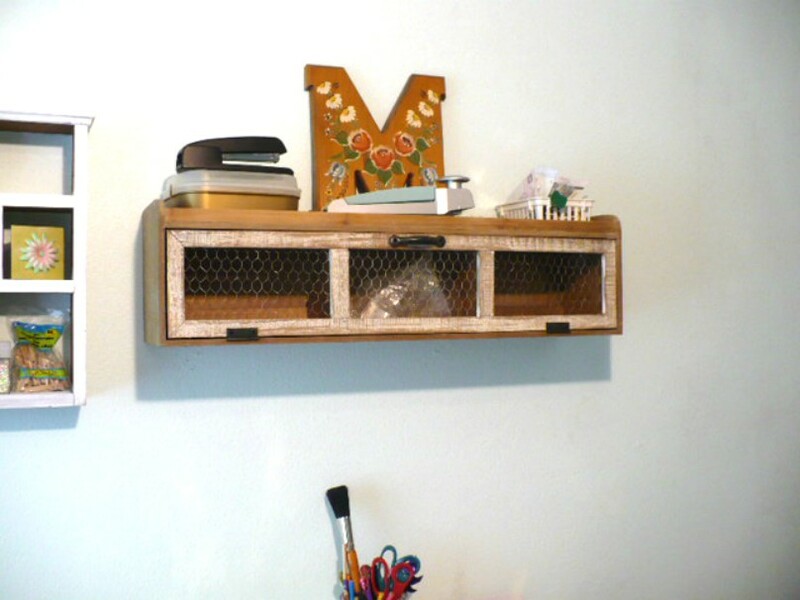 The shelf above has three compartments for more storage. The organizer on the left was perfect for my paper storage. I am so happy with how this craft room makeover turned out. What do you think? I'll be putting together a step-by-step tutorial for you with all the products I used and how we accomplished this in just 30 days. If you want to take part in my #2019organizingchallenge you can join us any time by signing up here. You'll get a series of emails with all my great tips and free worksheet to help you tackle your mess with ease. 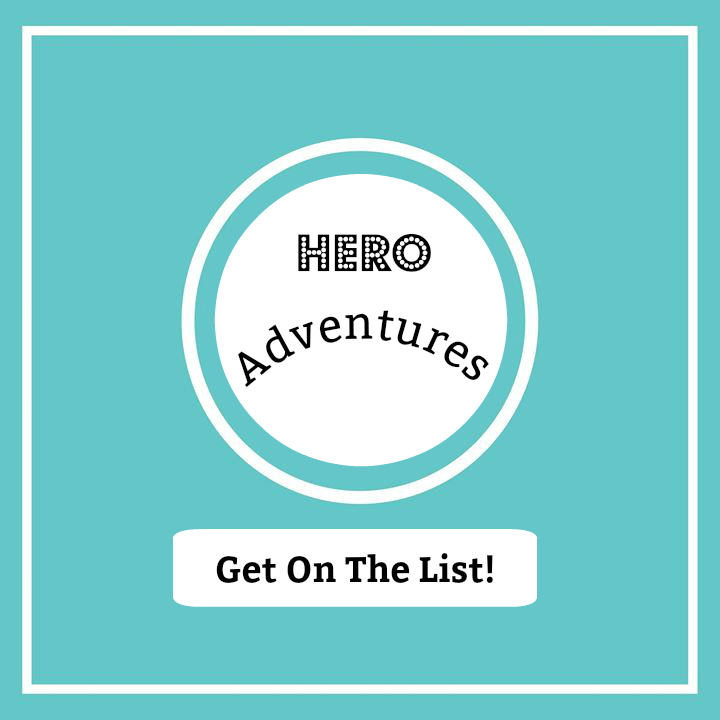 I've made it easy for you to catch up on the challenge in my previous blog posts. Read them here: Just click each title in order. Thank you for taking the time to visit my little corner of the world wide web. You can learn more about my mission on my About page, here. I've lived in Florida all my life of 56 years. I'm a wife and mother. I would not trade my family for anything in the world. We enjoy doing things together that brings us closer as a family and with our Creator. You'll find this is a peaceful place and a safe place to spend some time away from the stresses in your life. I offer you a way of life that is filled with love, peace, hope and friendship. If you want me to share my joyful life with you in my weekly 'happy mail' you are more than welcome to sign-up here today! 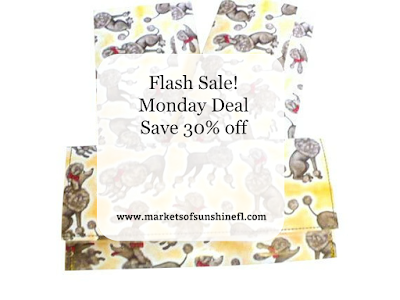 We have a great flash sale for all you DIY Home Maker's. Receive 30% off your favorite DIY supplies in our Etsy shop, Pioneer Fundraiser today only. April 15, 2019. 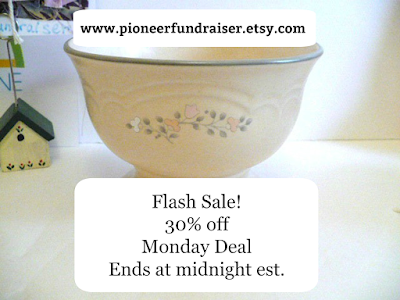 Offer ends at midnight est. 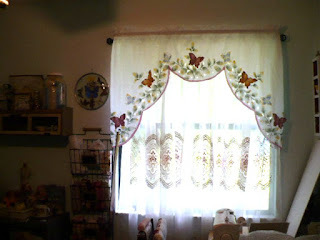 You'll also find some great home decor items from around the world in our shop that are vintage and in great condition. Try not to miss this deal. I don't know when I'll be offering 30% off again this year. Bonus offer! In addition to the DIY sale in our Pioneer Fundraiser shop. I am also offering 30% off in my Markets Of Sunshine Etsy shop. 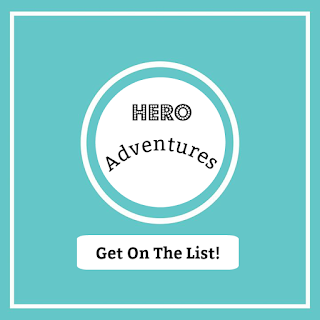 You'll find eco-friendly zero waste handmade products for the wanderlust traveler in you. My handmade wallets and envelope sets are all hand stitched so they won't come apart. They are also laminated so they won't get dirty. Then I add a snap closure to the wallets so your contents stay secure inside. I'll be pulling my Winter collection soon. Don't miss out on getting a great deal on your favorite set. They make a great gift for any occasion. Plus, you can have custom orders personalized. Ready to ship items are not personalized. Come on over today and pick up your favorite before it's gone. Sale ends at midnight est on April 15, 2019. Be sure to Favorite both shops so you stay informed of our new arrivals and sales. Have a great day. Let me know you found me from this post and I'll add a surprise gift with your purchase.